The Airports Commission will now begin going through the tens of thousands of responses to its consultation that has just closed on where additional runway capacity in the South East should go – a second runway at Gatwick or one of two options at Heathrow – a third runway or splitting the existing northern runway in two to allow for simultaneous landing and take-off. As both the Heathrow proposals would make the quality of life significantly worse for residents in the constituency I am standing in, my response to the commission centres on my opposition to expansion, and the need to retain the existing periods of peace. I also call for a much more generous mitigation package for residents around Heathrow irrespective of whether or not expansion goes ahead. Around 100,000 people, most of them living in Hounslow borough, live within the 60Lden contour (dBA) – it’s very noisy! For most this means a plane overhead every 60-90 seconds for eight hours each day. Flights start at around 4.15 in the morning and continue to 11pm. Following the decision to allow Terminal 5 to go ahead, capacity at the airport is currently limited to 480,000 flight movements a year, 8-hour respite through runway alternation and an average of 16 flights between 11pm and 6am The day-time respite periods operate when the airport is on westerly operations (70% of the time and dependent on wind direction). 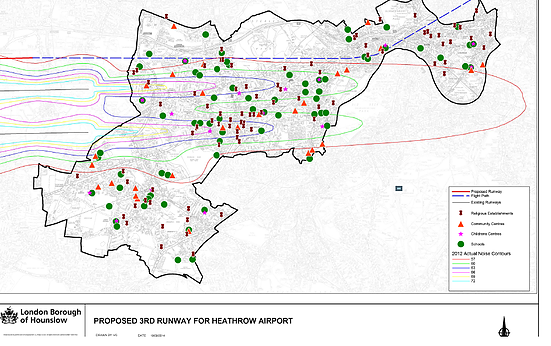 The landing path of a third runway would be over tens of thousands of homes in Osterley, Brentford and parts of Chiswick (as well as Heston) not currently severely affected by aircraft noise, and in both this and the Heathrow Hub options the area under the current landing paths would be significantly noisier as the periods of peace are cut. As there is a mounting body of evidence about the impact aircraft noise has on the human body; we have a duty to protect the health and learning opportunities of future residents and children of the borough by ensuring that Heathrow’s activities are contained within the current flight cap and respite regimes. It is essential for improved quality of life for those living next to the biggest airport in the UK, that the noise should gradually decline as engine technology allows, rather than quieter aircraft or more generous insulation schemes be used as a justification for expansion. What residents need now, whether or not Heathrow expands, is a legally binding package of measures, independently managed, that guarantees the daily respite periods that alternation brings. Noise levels should get no worse than at present, the insulation package be equivalent to that for other major airports, and mitigation measures should be managed independently of the airport operator. Air pollution around Heathrow, from both planes and road traffic, already breaches EU limits and the Commission needs to carry out a lot more work on the impact of expansion. Evidence is emerging of the impact of aircraft noise on sleep patterns, on heart and lung function, and on children’s cognitive learning so I have said that a full health impact study should be carried out. The Commission also needs to do more work on the local economic impacts for sectors and business not directly related to Heathrow. Heathrow is, and must remain, a significant employer and business generator locally, but it doesn’t need to expand its runway capacity to retain that essential role. The economy here is already too dependent on this one source of employment and business growth. Heathrow lies in the Thames Corridor close to central London, and other sectors are thriving and growing. Whilst many businesses value their proximity to the airport, they also have to compete with the airport for what are already scarce recourses here: land and premises, skilled and unskilled staff, road space, and market and social housing. They also experience the noise and have to pay the mitigation costs. Expansion would only exacerbate these pressures. Heathrow describes itself as the business airport but the airport’s own figures show that only 30% of their passengers are travelling on business, and the rest for leisure. If Heathrow wants to fit its marketing description as the UK’s business airport, it could do so by using the slots and adapting the business model without the need to increase the number of flights. Heathrow could address the underused capacity of empty seats by reducing the number of daily flights to many destinations and support High Speed Rail to continue to bring down the need for sub-300km journeys within the UK. Traffic congestion around Heathrow even now has a significant impact on business viability and on quality of life. No impact assessment of the impact on local roads of expansion has been made by the Commission nor their potential economic impacts. It is essential that the airport provides significant public transport improvements, to reduce vehicle-generated pollution and achieve a significant level of modal shift. The airport should fund major improvements to rail, bus, light rail and tube provision around and into the airport. In conclusion; most residents here already live in an unacceptable noise climate, and those not already severely affected would be if a third Runway is built. To improve the quality of life here, we seek stronger mitigation now, more efficient use of existing flights and slots and no increase in flight movements or in runway capacity. Heathrow should be Better, not bigger.